The purpose of this page is to guide users through the process of requesting access to UW Health systems, including HealthLink and all other systems hosted by UW Health. The requirements and steps listed in the below chart vary slightly based on the role of the individual whom access is being requested for and the type of access being requested. The variations for different roles and access levels are described below. The first three requirements below should be completed simultaneously to expedite the access request process. Compliance certification is required for all requests to access UW Health computer systems and involves confirmation by Central HR Operations staff that compliance requirements have been met. For all individuals, these requirements include a background check, HIPAA training, and a confidentiality agreement. For individuals who will have patient or research subject contact, UW Health Safety and Infection Control training and TB testing are also required. Please contact the HR Operations staff for your department to initiate compliance certification. A Computer Systems Authorization Request (CSAR) must be submitted through UW Health ServiceNow for all requests. Log in to ServiceNow with your UW Health credentials, type “SMPH CSAR” into the search bar, and click on “UW-Madison School of Medicine and Public Health Computer Systems Access Request” in the search results. Refer to the UW Health ServiceNow SMPH Computer Systems Access Request (CSAR) FAQs below for more information. In some cases, additional documentation needs to be attached to the CSAR form. The additional documentation varies by role and is summarized in the following table. ** Researchers who are also licensed RNs must obtain approval from the UW Health Nursing Education Department and RN Research Practice Committee prior to practicing as an RN in the UW Health clinical environment. Please refer to UW Health Policy 9.85 to access the application or the Research RN’s page for additional information about this process and contact RN RPC Chair Tammy Kiger at tkiger@uwhealth.org for any questions about the Research RN onboarding process. HealthLink training is required before requests for more than view-only access to HealthLink (including the Research Coordinator role) can be provisioned. Additional information on training is located on UConnect and users can register for/inquire about training by contacting hleduopsupport@uwhealth.org. HealthLink training is not required for view-only access, but informational training for view-only HealthLink users is located on UConnect via PDF and an audio-visual presentation. Once the CSAR form is submitted through ServiceNow, it will be routed to SMPH staff to confirm that the employee has met compliance requirements and that the requested access is in line with HIPAA standards. 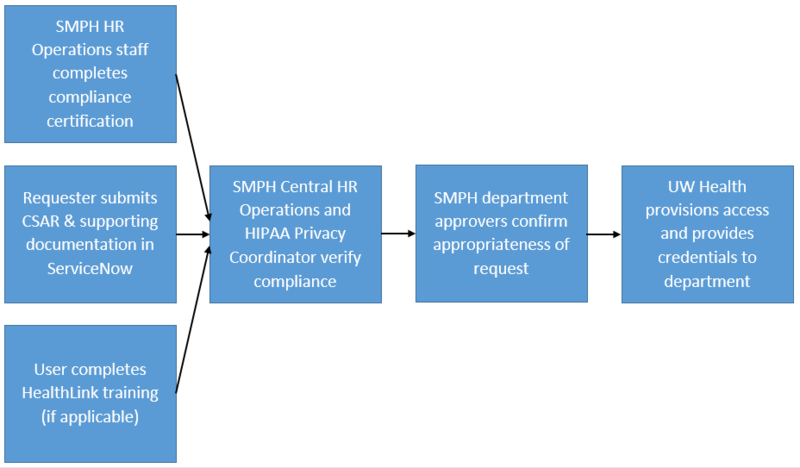 After SMPH compliance approval, the CSAR will be routed to departmental leadership to approve that the requested access is appropriate for the employee’s work. After departmental approval, the CSAR is sent to UW Health for provisioning. Requests typically take up to five business days to provision once received by UW Health. However, requests may require additional research and take longer to fulfill if access has not previously been provisioned to someone in the user’s role and/or for the intended purpose. Once access is provisioned, credentials for the requested access are provided to departmental leadership. What form should I use in ServiceNow to request access to UW Health computer systems? When you log in, you will search for “SMPH CSAR” to find the correct form. This form should be used for SMPH employees, students, contractors, and UW Health employees who are “departmental hires.” Departmental hires are paid through UW Health, but are supervised by SMPH personnel and report up through Department Administrators. Please do not use the UW Health CSAR (as opposed to the SMPH CSAR) for staff in these roles. How long will it take to obtain access? After submission, your request gets routed to the SMPH HIPAA Privacy Coordinator and Central HR Operations to confirm that compliance certification has been completed and there are no HIPAA issues with the request. If compliance certification is complete and you requested only items from the dropdown menus on the SMPH CSAR ServiceNow form, SMPH HR will typically validate requests within 3 business days. However, requests can take longer if the compliance certification is not complete and/or you request access that is not standard/not selected by using the pick lists. How should I submit authorizations for credentialed providers (physicians, advanced practice providers)? New providers to be credentialed through the Provider Enrollment department will receive UW Health computer access as part of overall provider onboarding at UW Health. There is no need to complete the SMPH computer request form. The Account credentials will be provided to the Education department for release to the provider during their initial Health Link training session. Authorization for credentialed staff is inferred by the credentialing process, and UW Health Information Services maintains a list of standard permissions for each clinical specialty and provisions standard access for all providers in the same discipline. After a new provider receives account credentials from UW Health and determines permissions are missing, or if a new access need is identified for an existing provider, it is acceptable to use the UW Health ServiceNow SMPH CSAR form. Please use the departmental selections available on the menus, or where necessary, use the Additional Information field. Be as specific as possible when using the Additional Information field to facilitate efficient processing. Will SMPH be able to obtain UW Health credentials just to log in to systems like ServiceNow and UConnect? Yes. While UW Health was unable to accommodate basic credentials requests with the old manual process, the ServiceNow process allows requests to be processed far more efficiently so UW Health is able to provide access for additional users. If several staff need access to the same systems, can I submit one form for all users? At this time, no. While there is a Group Request form available in ServiceNow, that form does not leverage the unique workflow for SMPH that assures compliance and authorization steps are also completed. How do I attach additional documentation to the CSAR? Clicking the paper clip icon in the bottom right corner of the CSAR form allows users to attach documents. What should I do if the tool or system that I would like to access is not listed on the CSAR? Please contact the SMPH HIPAA Privacy Coordinator for assistance. Note that these requests may take longer to provision than a standard request. ServiceNow is updated with the current status of the request and any comments entered by reviewers. This information can be viewed and comments/questions entered by logging into ServiceNow selecting My Tickets on the upper right and selecting the appropriate ticket. If you have questions about your ticket, please enter a comment on the ticket. If you are not able to log in to UW Health systems, contact the UW Health Help Desk at (608) 265-7777 to have a staff member reset your password. The help desk is available 24 hours a day, seven days a week.